One day. Every person. Our Community. Tomorrow is the Day! 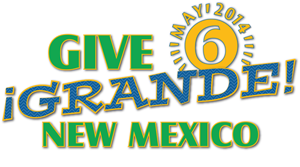 Every gift given to local nonprofits through Give Grande New Mexico will be magnified by matching funds from local donors and national sponsors! Donate online at www.givegrandenm.org—it’s fast, easy and secure. Help us make history in New Mexico by Giving Grande!